In Deuteronomy 25, Moses commanded that if a man dies childless, his brother should marry the widow and that "the first son whom she bears shall succeed to the name of his dead brother, that his name may not be blotted out of Israel." The practice, called "Levirate marriage" was the backdrop for the Sadducees' trick question for Jesus about the woman who married the seven brothers (Matthew 22). If the surviving brother refused to fulfill his duty and marry the widow, she had options. One was to pull off the deadbeat brother's sandal, spit in his face, and say, "So shall it be done to the man who does not build up his brother's house." Today, Levirate marriage is rarely if ever practiced, even among the most traditional Jews. Instead, an increasing number of Israelis have found a new way to achieve the goal of Moses' command. Now, IVF, as we've discussed a few times on BreakPoint, is a procedure laden with ethical challenges, at least from a Christian perspective. Even so, the Jewish state has added a new ethical dilemma by fully subsidizing IVF "procedures using genetic material from deceased spouses." That is, retrieving sperm from a deceased husband, and using IVF to create and implant an embryo. If the idea of creating a child from a deceased husband sounds strange, hold on. It gets even stranger: this procedure isn't limited to widows. The article tells of an unmarried woman whose "biological clock" is ticking more loudly. She wants to have a child using IVF but is concerned about that child not knowing its father's family. 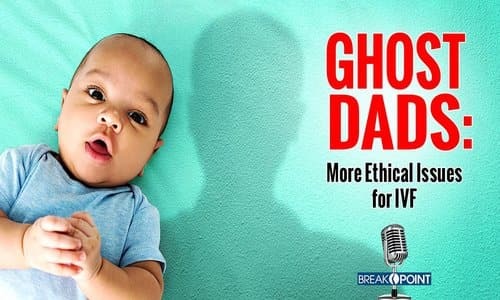 We're talking here of the phenomenon of "ghost dads," and it raises a host of ethical questions. First and foremost is that the child is not the fruit of a union whose purpose was to produce her. Instead, she was conceived to meet someone's else's emotional needs. As a social worker at Hebrew University asked: "Is it ethical to create a child as 'the means for fulfilling the wishes of an adult, in any way possible, and at any cost?'" Another expert quoted in the article raised questions about the impact of what he called "planned orphanhood." We have no idea how a child "will feel knowing that he is not an individual, but a copy of someone else . . . a 'living monument to the dead.'" By the way, the "ghost dad" phenomenon isn't limited to Israel. While some European countries explicitly forbid it, the United States doesn't. What's more, the rates of children reproduced posthumously vary from state to state, furthering reinforcing their status as means rather than ends. Even though, as I mentioned recently, Israel treasures children in ways that few nations do, you can't say the same of the U.S. Too often here, "having kids is something you get around to" and the thing we worry most about is having the freedom to live as we please. If kids get in the way, we eliminate them. If they serve our purposes, we accept them. We might even use our technologies to make them. Either way, in any country and everywhere, it's wrong. The point of having children should never be us. It should be them.